Last week, I received an e-mail from a reader that told a discouraging tale. The reader explained that the story might one day become a blog post. The reasoning? It might prove a cautionary tale to help others avoid a similar situation. I cautioned against sharing it. I caution a lot of bloggers anymore. Too many of us have an idealized view of how the world works. In addition, none of us is prescient enough to understand what the world will become. We believe an innocent activity will always stay innocent. People can be trusted with your confession and mine. I’ve been blogging since 2001. I had a blog before Cerulean Sanctum that dealt with the tendency in our society toward lowest common denominator thinking and action. I still write in Cerulean Sanctum about that fatal flaw, but not quite as much. Bigger fish to fry, as they say. As I enter my seventh year of blogging, I’ve accumulated some painful lessons. Blogging is an essentially naked enterprise. You can’t blog for any length of time and not post personal information. Even on a site like Engadget or Lifehacker, blogs that look at what’s happening in the world of electronic gizmos or discuss ways to make your day-to-day living more efficient in a hectic world, the blog owners reveal personal details bit by bit. In many ways, your blog is you. Godblogs go one step further in that the very nature of talking about faith exposes the talker on an intimate level. We’ve all heard the aphorism that polite company resists talk of religion and politics. Blogging, on the other hand, delights in discussing the raw truths and lies that occupy the core of what we are as a society and as individuals. And there is much danger in this. Danger that we ignore at our peril. 1. Google has a long, vast memory – I can find material on Google that I posted to Usenet newsgroups 20 years ago. Little did I know that someone would one day collect all that data and store it forever. Google bought up the archives of Remarq and DejaNews and now you can find what I said on alt.rec.music.christian circa 1987. When I typed that Usenet comment, did I ever dream that someone in Singapore 2007 would use a “Web browser” to access a “search engine” to reference something I said around the time that “Walk Like an Egyptian” was the #1 song in America? Truth is, I should have known better. Today, Google (and whatever search engine will replace it one day—hey, Alta Vista, anyone?) is cataloging what you blog almost as fast as you blog it. All your personal revelations are being stored on a massive conglomeration of RAID-arrayed hard drives for access by anyone who wants to know about you now and in the future. Just the other day, a client asked me to interview a businessman. I sent a brief note asking the businessman what time he might be available. I later called him. In the course of conversation, he asked me about my organic farm. I was stunned. How did he know I had an organic farm? Simple—he’d googled my name and read what I’d written online. While that should be obvious, it’s still startling when it occurs. What’s more startling is that people are beginning to default to that behavior. Singles google prospective dates. And businesses google prospective employees. The Wall Street Journal recently had an article that described in great detail how employers are bypassing the old-fashioned means of getting info on an employee and going right to Google. 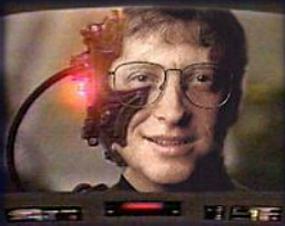 So if you’d like to work for Microsoft, but a youthful indiscretion a small eternity ago led you to post on your Web site a pic of Bill Gates as a Borg clone (possibly with added devil horns to ensure your mixed-metaphorical point), it doesn’t matter how much you fawn over Microsoft products today. You may need to stick a fork in yourself. Even personal Web sites or blogs you had years ago that are now offline or deleted are stored in sites like the Wayback Machine at Archive.org. You press that Submit or Publish button and your little comment is now one for the ages. As Christians, we need to be highly concerned about where this is leading. Non-sectarian employers, by law, cannot ask us about our religious or other closely held beliefs. But no one can stop them from googling us and finding our less-than-positive article blog post about Zoroastrianism or homosexuality or even Fiat automobiles. When your potential boss, a closeted Zoroastrian who loves Italian cars with a passion (even the crummy ones), googles your name and finds your opinion on your blog, what chance do you have of working for that guy? Zippo. And the worst part of it is he doesn’t have to prod you for that info or give his real reason for not hiring you. It all stays very hush-hush. If you’re a blogger, you must consider these things. We may think there is no cost, but one exists. The Church in the West has not accounted for this phenomenon, but it will need to. As anti-Christian sentiment continues to rise around the world, we must be prepared to help those who pay a price for speaking the truth. I can tell you right now that there are people reading this blog who have been discriminated against by search engine. Expect it to get worse. 2. Stalking – Stories are starting to come out about bloggers being threatened with violence because of something they wrote. Some bloggers have even acquired stalkers. That may sound far-fetched, but I’ve spoken with a few bloggers who told me stories I didn’t want to believe. We live in a sin-sick world. People exist who derive strange feelings from their interactions with others online, and bloggers are not immune to their dysfunctions. It’s no longer just celebrities who attract deranged people. We need to run a constant filter on the content we put out in public. While it may be true that we can’t account for every trigger for every off person out there, we must be wiser on this issue. Even now, I’m reconsidering some of the content I’ve placed online. 3. Blogging can be an addiction – While there are fewer personal journal blogs percentage-wise than a few years ago, they still exist. And even if a blogger doesn’t use his or her blog as an online diary, it can still take on a life of its own. Some bloggers can’t walk away. The thought that their hit counters start going down if they don’t post for a few days leads to despair. Some live out their entire lives online and the thought of anything happening to what they’ve built up becomes a crushing load that keeps them writing and writing and writing. And that writing often comes to the detriment of their spiritual lives and the lives of other family members. Here’s a hard blogging truth: readers are fickle. As much as I love my readers and have some of the best readers in the blogosphere, reality is reality. I had to reference a post from a few years back and only one commenter out of about thirty on that post still comments. C’est la vie! If you’re constantly living in fear that you can’t hold folks, then get out today. You have to have another reason for blogging than numbers and their faithfulness to you. I could say a lot more on this topic. I haven’t touched on the social network sites and how they are being used in nefarious ways, too. Life online is more dangerous than we think. More and more people are going to scratch their heads and wonder why they didn’t get a job they were perfect for or why supposed friends stopped calling. Information is power and the Web is pure information. Those who know how to tap its resources hold considerable sway over us. I may be giving away my age (and it might be used against me <grin>), but I remember a line from a famous TV show that applies to this issue: Hey people, let’s be careful out there. As someone who has had police intervention with obsessed listeners or viewers in broadcasting I want to be clearly heard in what I’m saying. Being stalked is not your fault. The nature of mediums may lead to mentally, emotionally and spiritually unbalanced people taking an unhealthy interest in you or your work for various reasons, resulting in annoying to literally life threatening. I don’t think you meant to phrase your point in a way that blamed the person being stalked, but you did. I’ve had to help with threat assessments for online writers, we don’t blame them for the threats we’ assess, anymore than police blamed me for stalkers and obsessed fans in broadcasting. Professional writers know this goes with the territory. You are a professional writer. If you haven’t been stalked then you have merely been lucky and I hope you never have to go through the experience. I would not wish it on anyone. Since you want to put the weight and onus on victims, perhaps you could elaborate on some of the ‘triggers’ that set off ‘deranged’ individuals. Define ‘wiser’ for us. Explain what you see in your online content that you feel you need to reconsider. Yes, we can all learn prudency, but some of the wisest people I know are harassesed and stalked. I think I understand what BD is saying, and that is kind of my reaction, too. Some more specific examples or categories would probably keep this post from sounding like a general fear-generator. I appreciate your heart in this, Dan. It is a paradox isn’t it? The most interesting blog posts are those that are personal, transparent and vulnerable.. really, the most boring are those long-winded “teachings”. Yet, those problematic posts are probably the ones that are most revealing. So, the question is how much do you reveal.. how transaparent should you be.. is it appropriate to be vulnerable at all? Goes back to the where your posts come from.. your guarded fearful brain or your trusting open heart.. probably a bit of each. I am relatively new to blogging. Only 6 months now. I find it very therapeutic. It’s not like alot of what is dicussed you can bring up in a bible study. Alot if it yes but some of it no, at least not when it comes to critiquing churches and theology. I hear what your saying in the above post Dan. Just like pastor’s messages that are taped are available for review years later we also reserve the right to change our thoughts and opinons about issues. As long as we walk in our integrity for the most part I think we are ok. I come from arminian camps. Nobody blogs there or even knows what a blog is. If anything, I’m trying to say that bloggers are NOT responsible for picking up stalkers and such. I’m simply saying that we should not be ignorant to the truth that it does occur. Just because I mention that some wisdom is called for here does not mean that I’m saying that bloggers are asking to be stalked. What do I mean by wisdom? I don’t use my wife and son’s names in my blog posts. It would be simple to discover them elsewhere, but I don’t want their names filling up Google via WordPress. When I write about my family, I keep the details to a minimum. Most of what I’ve written about them is quite generic. I write in such a way as to discourage fanboys. While I do have dedicated readers and have created some friendships both personal and business through the blog, I avoid writing in such a way as to whip up the fanboy flame. So far, I’ve not generated a fanboy readership. On the other side, I don’t attack personal “enemies” on the blog, either. By avoiding the extremes, I hope to call attention away from myself and away from any idea that I am condoning or attacking anyone personally. I hope to discourage what might result from whipping up either side. What I aim for here in style and space is L.L. Bean rather than Frederick’s of Hollywood or a Soldier of Fortune catalog. And I do that for a reason. If I were a woman blogging, I’d be exceedingly careful about personal details I dish out on the Web. Even posting pictures may not be a good idea. Posting pictures of your kids in your blog may not be a good idea, either–I’ve heard some terrible stories. Google likes blog posts because they are fresh content. As a result, blog stuff winds up high in search results. If you must post personal content on the Web, a blog may not be as good a place as some other options. I have a personal site from many years ago that I’m considering pulling down because I did not think through the ramifications of what I put there. I think we all need to think about how much of our life is online. This is not about fear but caution and wisdom. Again, we can’t remotely control another person with problems, but we can take steps to lessen the possibility of attracting them to us. Good stuff to keep in mind. Back when I was dating my wife, she would complain sometimes that I never talked about her in my blog. That it was a bunch of computer, film and music stuff, but not much personal stuff. I told her I’m hesitant to get too personal, particularly about other people in my life because anybody can read it and Google and other sites log it in perpetuity. I try to add a bit of personal stuff here and there, because otherwise blogging can become too sterile. But yeah, you have to balance all that. This is an excellent post, Dan. And I like the term you coined: “Google Persecution”. People discriminating against others unfairly has been around for a long time, and we can never completely escape from it. Search engines have just made it easier for some people to find excuses to discriminate, whether for reasons of politics or religion or whatever. As a free people, we have long had in this country the right to speak our minds. It’s too bad our technology is now getting used against us to erode that right (Don’t ask me what I think the U.S. government is now doing behind the scenes.) A totalitarian society is one where everything gets internalized; you dare not speak what you really think on the inside, while on the outside you are forced to parrot what the Powers dictate. I have my own blog, which practically no one reads anymore. And over time, I’ve tried to tone things down, and been more careful on what I post, and I post less frequently. Also, I’ve been more careful about getting too chatty in comment boxes. However, it would be too bad if an atmosphere of fear were to take hold in this country and force blogging to become entirely vapid and wishy-washy, because in that case things would be so bland nobody would bother to read it anymore. Blogging would be deader than it already is. For the most, I’m falling in with BD on this one. Speaking of my own life, bracketing out the needs of my family which Dan addresses, I live a public life as a pastor, one that puts me in direct, intentional contact with others, some of whom are traumatized, violent, disoriented, sick, or dying. I live on 24 hour call. Anyone visiting my blog could find me without much trouble. I leave it with God. For me the danger is not as great for what others might do, though that is real, but in failing to help in the right way at the right time. And then there is the more subtle danger of being addicted to risk, especially at the expense of others. Could we unconsciously at times make ourselves vulnerable, like good masochist, just because it taste good? Do we know ourselves well enough to know what we are willing to risk so that we might make a meaningful connection with some else. Ours can be a desperate and lonely world. With that said, Dan, I think your cautions are especially relevant for bloggers who have not intentionally chosen a public vocation. Your post is well worth reading and taking to heart. God knows, I worry about what some very gullible acquaintances are doing on the web. That I won’t give you their names or tell their story is an example of how I take your advice. That’s a bit clearer Dan. I don’t think just women have to be prudent, men are also targets, I dealt with an elderly male as target last week – I’m glad you started to flesh this out. You have IT experience, writer experience, church experience and certainly have the ability to put some meat in this – take specific questions and experiences from your blogger/readers, give practical examples of dangers and solutions with balance. Peddle it to inhouse pentecostal/charismatic zines, direct at the sub groups higher level of trust, faith and perceived isolation since you understand them intimately. I don’t know how much access they have to someone such as yourself who is capable of writing about this topic pragmatically and experientially. I think you have the germ of a paying piece here. I have only been blogging for about the last 6 months. I find it very therapeutic. Some of what I share on blogs I could never say in a home fellowship group. I have heard it said that only calvanists blog. The “don’t touch God’s annointed” abusive churches I left definately don’t blog. They barely own a computer. Yes everything is discoverable in court whatever is in cyberspace. Pastors’ tape their messages, write books etc and they have the right to make retractions and change their mind about issues as well. So can;t we. Blogs are great for information sharing. Your points about people who are emotionally disturbed are right on though. What impressed me the most regarding this post was the insight: “None of us is prescient enough to understand what the world will become. We believe an innocent activity will always stay innocent.” This is true. And it’s caused me to rethink some things. Thanks. Kansas Bob brings up an interesting paradox. How much do you reveal about yourself so your readers can feel “warm” toward and relate with you? I decided early on in my blog (which I began in the summer of 2004) to not reveal a lot about myself. I might be suffering numbers because of it–I don’t know. People who read my blog know very little about me and so perhaps they don’t feel real warm and fuzzy toward me….I don’t know. I think it’s more difficult for a woman blogger in this regard as people expect her to be very transparent and talk about her family and stuff. However, sometimes I am googling something and my name comes up and I am shocked at what I wrote…LOL. So, I am really careful these days about what I write and how I write it. One post I wrote not long ago included a description of what a certain emergent leader thought. It wasn’t a direct quote but he thought it was. He wrote me and was pretty angry. I decided the best thing to do was to delete that part of the post (after apologizing and explaining to him what it said). I find the emergent village people now now really googling their names and fighting back if they don’t like something. So, if you write negative stuff about them–watch out that you are very, very accurate. I started my blog in 2004 to recuperate from a spiritually abusive church. I lost some friends when I left the church because they didn’t agree with how I criticised the church and its pastors. When I began the blog, I was anonymous, but a few years later, I ‘came out’. Now, I’ve removed my name and all, but if you type my name in Google my blog still comes out first! So, yeah, be prepared to lose friendships with those that don’t agree with your point of view .. I wished she didn’t find the posts, but do I regret writing those posts. No, because people need to know what it means like to have people you love turn their backs on you just because you decide to leave the church or criticise the unethical practises of certain pastors. Abusive churches and ministries is serious business. According to FACTNET going after finances is the only way to stop them from continuing. You have done nothing wrong with telling the truth. It is still a huge problem. Thats why teachers bear a stricter judgment. I understand your premise all too well. The internet is an amazing place to meet interesting people and learn all sorts of things, but it’s also a place where you really need to watch your step. I haven’t been blogging long, but having been online since late 1999, I have experienced a great deal, some wonderful things and some utterly terrifying. I once had the distinct mispleasure of having to imform a poster on a public movie website that he had the choice of leaving me and my husband alone or I would be filing charges of stalking and harassment with the state police. (It’s a long, sad story and one I do not wish to rehash here.) I’ve also used several unrelated post names in those 8 years, mainly to prevent various people from following me throughout cyber-space and spreading havoc. I try to keep identifying remarks few and far between, having learned the hard way that there are people out there who keep files for no other reason than that they’ve taken a dislike to someone………and like it or not, if you take a public stand on something controversial, someone IS going to dislike you. BTW, I have done a google search on myself and the results have been interesting. Some old posts still linger, but mostly linked to post names I no longer use and forums I no longer visit. I’ve also dropped addies for the sake of privacy as well. I am not fool enough to think I’m untraceable, but I try to make it as frustrating as possible for unfriendlies to follow me. Blessings to you and all you hold dear……. Wow! Fascinating Article -and very informative. Good information and wisdom too!